﻿ Best Price on Casa Turire in Turrialba + Reviews! Offering a year-round outdoor pool, children's playground and sun terrace, Casa Turire recalls an antique hacienda home located in the heart of the verdant Turrialba agricultural regions. Casa Turire features 12 standard rooms, 3 suites & 1 master suite. All completely equipped with direct dial telephone, safe, full bath with hot water, hair dryer, satellite television, ceiling fan, coffee maker & private balcony. The suites are specially equipped with hot tub in the bath & hydro shower, plasma television with DVD & air conditioning. There is a 24-hour front desk and gift shop at the property. The hotel has water sports facilities and a ski pass sales point, and guests can enjoy a drink at the bar. Free WiFi is provided throughout the property and free private parking is available on site. 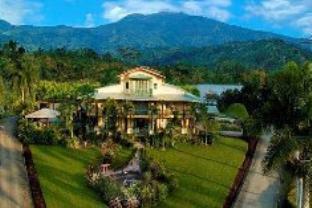 It is enfolded by the Angostura Lake with the imposing presence of the Turrialba Mountains. The area is popular for horse riding and cycling. Santa Cruz is 9.3 mi from Casa Turire, while Cartago is 19 mi from the property. Located a 2 hours' drive from San José/ Casa Turire sits on the banks of the Angostura Lake in the heart of the Turrialba Valley. The nearest airport is Juan Santamaría International Airport, 39 mi from the property.